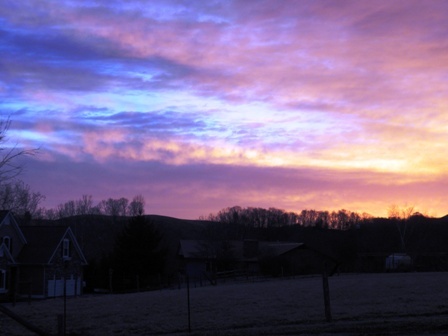 After the winds of yesterday, to see this red sky this morning, I thought what could be coming our way now? We’ve been blessed with lovely weather these last few days. Even with the wind we’ve had you could still enjoy the sun beaming down. But, yesterday’s wind was just plain rough. The weather has been warm for this time of year, and I’m sure many bees were out and about doing their thing; forging to find what is in bloom. I know a friend of mine posted on his Facebook page that his bees were bringing in yellow pollen and he wondered what or where they got their bundles. Someone replied it may be some trees that are starting to bloom. 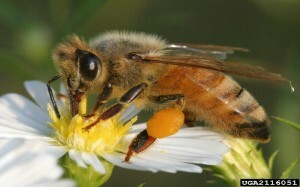 During foraging, a bee’s body becomes dusted with pollen. Her tongue protrudes and regurgitates nectar that is whipped onto the forelegs, which then brushes the head, antenna, and front of the thorax free of pollen grains. Pollen on the back of the thorax is combed off by the middle legs and pollen on the abdomen is gathered by brushing movements of the hind legs. Eventually all the pollen is transferred to the hind legs. Here, a specialized rake, rakes the moistened pollen off the opposite leg onto the auricle of the metatarsus. This area, at the joint of the metatarsus and tibia, acts as a pollen press when the joint is bent squeezing the pasty mass of pollen up into the pollen sac (basket) where the pollen accumulates. The middle legs help mold, pack, and shape the pollen load into its characteristic kidney shape. It’s a good explanation, but personally, I like Bernie’s. I can relate to the idea of a jack and how it must look if you were watching the bee move the pollen, up close and personal. After hearing how a bee uses its hind legs for carrying the pollen back to the hive, I was intrigued to hear what happens next. Bernie shared that when the bee returns to the hive, the house bees will often watch nearby as the forager moves into to position and ready herself to empty her pollen sac into a waiting cell. She will groom herself and dip her hind leg into a cell that may be empty or have pollen in it. She uses her middle legs to pry the pollen free and allow the pollen to drop into the cell. The forager will continue to groom herself to remove any remaining pollen that may still be in her pollen sac (basket). Once the forager believes she has groomed herself successfully, she’ll leave the cell for another bee (house bee) to push the pollen load into the base of the cell and pack it into place using her mandibles, face, and forelegs. After the forager deposits her load, she will solicit a third bee for honey, and then return to forage for more pollen or nectar. As interesting as it is to listen as Bernie teaches, it is just as interesting to meet and greet beekeepers who are at various levels of experience. The room was full, about 75 strong. We met people who are just starting to try their hand at keeping bees (newbies like Hobbit King and I). We met people who had kept bees before, got out of it for some reason, and now are trying it again. And, we met people who have been with it for over twenty years. The experience in the room provided me with a since of security and awe. I marveled at how many people were interested and would come to a bee class and at the same time, I found myself asking why would someone want to come to a class if they’ve been keeping bees for so long? I realized that it was because a beekeeper is eager to learn and embraces learning to keep himself or herself informed of trends, changes, and the latest “new” methods of keeping bees. More importantly, I believe it is because beekeeping is a social hobby, just as the bees are social insects. Our class continues on Tuesday, so I’m sure we’ll learn even more interesting facts about bees as we build friendships with our new “bee” buddies. We decided to change the hive color. After looking at the full hive in sunlight, we determine the color may be a little too dark. Since we are placing a second coat on the hive, we decide to lighten the color by adding some white. 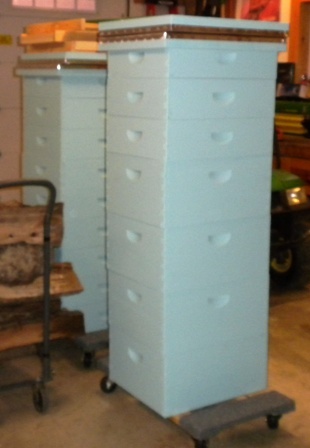 Here is a picture of the hives with the lighter, almost a sea foam green color. They are stacked in this manner for storage purposes for now. What we hope to do next is add a little more design to the hives. I’m thinking about doing a vine design with maybe a butterfly, dragon fly, and a few lady bugs; something that will be a lite touch and give the hives some character. We are also in the process of placing the bee hive stands in the garden area. We still need to finalize building the frames that will hold the comb foundation. As soon as we get those built, I’ll share pictures and talk more about this important part of the bee hive. Here’s hoping you have a glorious week and that the weather proves to be good for you and yours! This is just too cool when we see someone narrating this with such softness and make every little thing too much interesting. And thought that I was just passing by, looking for “winds of yesterday” related images on Google (I always do this with titles of music I’m just making). And the start of the text just met my thoughts right now. Came across this today on the website for our state’s ag college. Thought it might be of interest to you. CORVALLIS, Ore. — The application of a naturally occurring pheromone to honey bee test colonies increases colony growth resulting in stronger hives overall, according to a new study conducted by scientists at Oregon State University and Texas A&M University. According to Ramesh Sagili, coauthor on the study, “Division of labor associated with brood rearing in the honey bee: how does it translate to colony fitness?” resiliency to CCD may be increased through -better hive management and the use of optimal dose of brood pheromone — a chemical released by honey bee larvae that communicates the presence of larvae in the colony to adult bees. Optimal dose of brood pheromone that can stimulate colony growth may vary depending on the colony size, time of application and several other factors…Brood pheromone is not currently used in commercial bee keeping, however it’s application in research may result in the uncovering of mechanisms related to the division of labor, foraging strategies and colony fitness. About the OSU College of Agricultural Sciences: The college contributes in many ways to the economic and environmental sustainability of Oregon and the Pacific Northwest. The college’s faculty are leaders in agriculture and food systems, natural resources management, life sciences and rural economic development research. Thanks so much Janet for this wonderful link. It is great to get resources that show the latest research when it comes to Colony Collapse Disorder (CCD). We just had our monthly Mountain Empire Beekeepers’ Association (MEBA) meeting this evening at which we discussed the importance of knowing diseases and pest management. CCD is yet one more critical piece of information a beekeeper needs to be informed. Thanks so much for you lovely comments! I had forgotten all about the “bee’s knees!” I think you’re right! How cool! Your second comment is so full of great info. I’ve shortened and made sure the study link is provided. another great one, oh wonderful neighbor! I too, love the little yellow saddlebags on the honeys. definitely a fashion statement. Thank you Tai Chi Gal! So good to hear from you and receive your feedback. Hope you are enjoying this lovely day! Great article, HQ – and quirky title. Very interesting hobby and I so appreciate learning along with you. Your writing, as I have mentioned before, is clear, easy to read and easy to follow. Berny sounds like a fascinating man and a good teacher. I kind of liked the old color of the hives (teal green) but the light color is pretty too. With dark colors attracting heat and light colors repelling heat, does that have any effect on the hive and keeping the bees cool in the summer and warm in the winter? Hi Sandra…Thanks for the feedback! Your question regarding the effect the exterior hive color has on the bees is a good one. From what we’ve been told, it depends. It depends on the location, the weather, and it depends on the bees. In general, bees will do an excellent job of maintaining the proper temperature of the hive on their own. They have for many years in trees where they live in natural habitats. However, you wouldn’t want to paint the hive black in a desert area, though people do use black in extreme cold weather areas. The same is considered for white or very light colors. We’ve had experienced beekeepers tell us not to worry about the color and we’ve also had just as many tell us not to go too dark. Long answer to what is a very interesting topic that seems to go along with everything else we have been learning. As a beekeeper, try it and change it if it doesn’t work out.